While Microsoft Corp. continues to tout what it characterizes as strong license sales for its new Windows 8 operating system, launched last October, the new OS has yet to boost the flagging fortunes of its PC vendor partners. According to global PC shipment numbers released this week by IDC Corp., PC shipments were down by 6.4 per cent in the quarter, compared to the same period a year ago. Windows 8 launched almost one month into the quarter, but Microsoft and PC vendors had been offering new PC purchasers a free upgrade to the new OS since earlier in the year. IDC had projected a 4.4 per cent decline, so the numbers were worse than expected. On the vendor leaderboard, Hewlett-Packard Co. hung onto top spot with 16.7 per cent of then market, just head of the fast-growing Lenovo, at 15.7 per cent, followed by Dell and Acer. 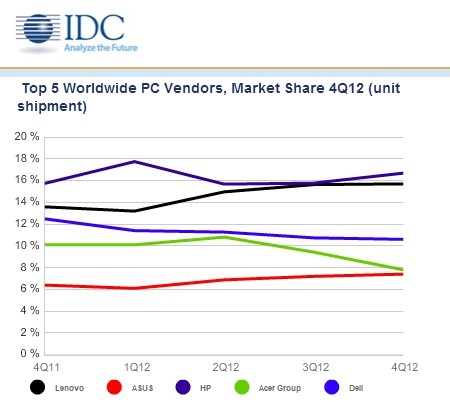 Global PC shipments by vendor, courtesy IDC Corp.
It’s important to remember that the IDC numbers represent shipments by vendors to manufacturers, not sales, which means there’s a lag in the numbers as retailers order product ahead of time to meet anticipated demand. Q4 shipments are usually low, representing an anticipated post-holiday sales slowdown. Still, the lower than forecasted numbers would seem to signal that retailers aren’t confident Windows 8 is going to fuel an increase in PC demand. If they did, they’d be ordering more and shipments would be higher. It will be interesting to watch for the Q1 2013 shipments to see if retailers anticipate stronger sales into spring/summer.